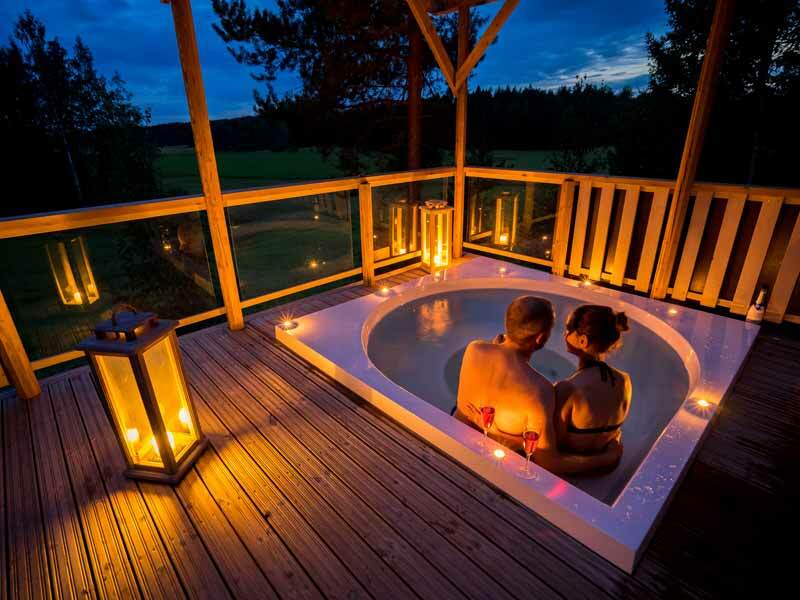 Romantic Cabin with Hot Tub in Päijänne Tavastia is a cosy one-bedroom cabin surrounded by fields and conveniently located just a couple hours from Helsinki. This freshly-renovated accommodation has the benefit of an outdoor wood-fired hot tub as well as wood-burning stove and sauna and is fully-equipped for self-catering. 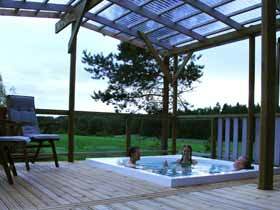 The hot tub is perfect for a relaxing evening after a day outdoors. Photo: TET. The cabin sleeps two adults in one bedroom with additional sofa bed sleeping up to one adult or two children (side by side). Spend your days discovering the walking trails which start directly from your doorstep. The cabin lies about 800m from the lake along a gravel path and a rowing boat and fishing permit are included as standard - ideal whether you would like to drift lazily over the water on a romantic excursion in the evening sun, or for trying your hand at catching some fish! Bikes, mountain bikes, e-bikes and canoes are also available to hire as optional extras for those who like to explore further by pedal or paddle power! Bikes and e-bikes make a great way to discover the area. Photo: TET. The cabin is located on an organic farm and the local area is fantastic for picking berries and mushrooms and your local hosts keep sheep in the fields nearby. You're welcome to join them on the daily tasks of feeding and caring for the sheep under the supervision and assistance of their sheepdog, Vilja. Unwind after an active day outdoors in the hot tub on your own terrace! 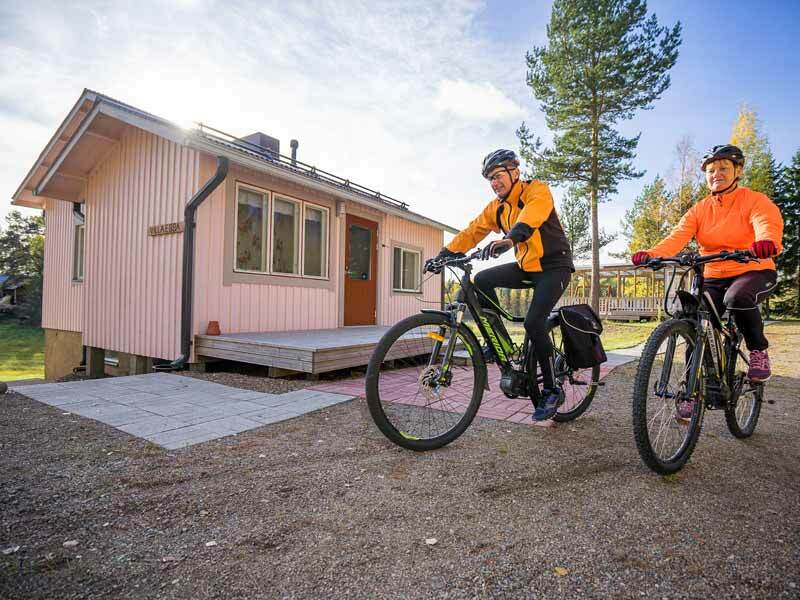 The Romantic Cabin is an ideal getaway for couples or friends with the freedom to be energetic or take it easy during your stay in southern Finland. Check-in is from 16.00 on arrival day. Please check-out latest 11.00 on departure day. The cabin is available for booking year round. Season for summer activities May to September, winter activities mid-December to March. Rental periods are normally 8 days Saturday-Saturday. Shorter stays are also possible by arrangement - please see under "Prices" for details. Check-in is from 16.00 on arrival day, please check-out latest 11.00 on departure day. For stays spanning two price periods, the higher period price applies. Prices given below are for weekly stays 8 days/7 nights, normally Saturday-Satuday. During the period 15.06-07.09.2019, half-week (5 days/4 nights) stays are also possible (normally with arrival or departure Saturdays), price 65% of weekly price. At other times (except Christmas/New Year/first week in January) stays of flexible duration 1-6 nights are also possible in addition to normally weekly rentals. Please contact us for prices for your chosen dates. NB: Please note that bedding and towels must be added for all prices below. Transfers: For guests travelling by public transport, taxi transfers are required (payable locally), either from Sysmä, price around €10/group (max. 4 persons) or transfer is also possible from Hartola at a cost of around €50/group (max. 4 persons). Outboard motor: For use with the rowing boat provided. Bicycle, mountain bike or fat bike: Hire includes helmet. Guided hike and berry picking: 2 hours, 2-5 persons. A guided hike takes you to all the best places in the local area for picking berries (typical season mid-August to end September). 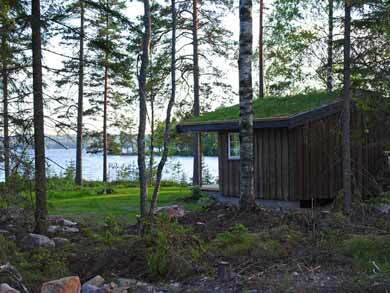 Lakeside sauna: Sauna will be heated for you. Please note that the lakeside sauna is not available in wintertime. Professional photographer: It is possible to arrange for a professional photo session with a local photographer during your stay to create high-quality images to commemorate your trip and focusing on a theme of your choosing. This is arranged and booked locally. Sleeps 2 persons in twin/double bedroom + sofa bed for additional adult or child(ren). The cabin is most suitable for up to 2 adults + 1 child, but up to 2 children can be accommodated sleeping side by side on sofa bed (note space will be limited in this case). Cot is available on request. Wood-fired hot tub on terrace with seating area and grill. Fully-equipped kitchen for self-catering, including basic cookware, tableware, coffee machine, electric kettle, microwave, electric oven, combined fridge/freezer and dishwasher. Wood-burning stove and electric radiators. End cleaning of the cabin is included on departure. Rowing boat and one permit for trawling. 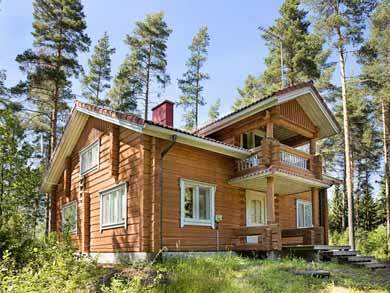 Hiking trails from 6 to 11 km, fishing and foraging for berries and mushrooms are available from your doorstep. Food. 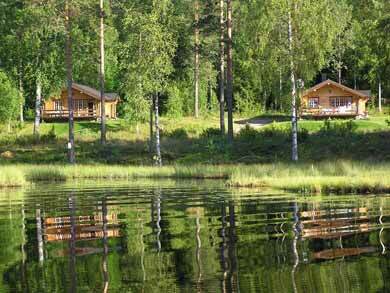 The cabins are fully-equipped for self-catering. The nearest shop is 4km away, 5 mins by car. NB: Please note if you choose not to have a car during your stay that you may wish to purchase all provisions for your stay before leaving Sysmä. There are no facilities where the cabins are located. It is 4km from the cabins to the nearest stores, so if you wish to replenish supplies during your stay, it is possible to walk to the stores. Alternatively, you may wish to walk in one directly and return by taxi with your shopping. Fishing equipment (available to hire on site). Suitable for adults and children of all ages. You should be in general good health and enjoy the outdoors. As a self-catering cabin experience, there is great flexibility to make your stay as relaxing or active as you wish, but any activities are optional. Level of challenge of activities will vary. The cottage can accommodate 2-3 persons in twin/double room + sofa bed for additional adult or child. Located on an organic farm. Your local hosts use organic products on their fields and production is checked every year to meet the standards for organic farming. Train from UK to Stockholm (Sweden) for ferry to Helsinki and onward train to Sysmä. Compare our range of summer accommodation experiences. Romantic Winter Cabin with Sauna in Päijänne Tavastia is the winter version of this experience.